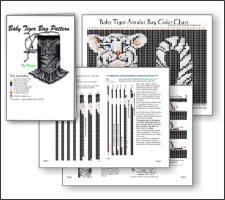 Beaded Baby Tiger Amulet Bag Pattern and Kit! 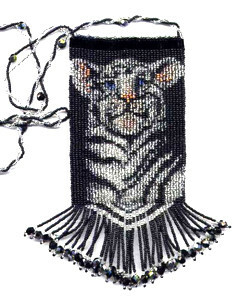 Beaded Baby Tiger Amulet Bag Pattern & Kit! Make your own Beaded Baby Tiger Bag Necklace! The Beaded Baby Tiger Amulet Bag is large enough to hold a flip phone and is approximately 3 and 1/4 inches wide by 4 and 1/2 inches tall. 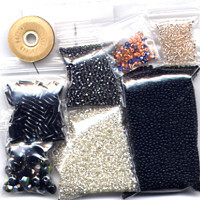 With the fringe, the total length of the bag is 6 and 3/4 inches long. You can easily change the length of the necklace. I use a variation of a square stitch. This Baby Tiger Bag pattern is done in this style. The stitch I use is quicker and softer than Peyote or Brick stitch. The difference is that with Peyote and Brick stitch the beads are added one at a time and stacked like bricks, as the stitch implies. With my square stitch the beads are added four at a time and are stacked like loom work, one directly on top of the other. The square stitch I use is different and is also called an off loom stitch.